With the very recent meeting held in St. Petersburg on August 8 last between Vladimir Putin and Recep Tayyip Erdogan – the only high-level meeting after the attempted coup in Turkey and the attempted murder of the Turkish leader, a coup which Russia first reported to Turkey and then strongly condemned – a new phase of post-Soviet geopolitics has begun. A new phase has begun also for Turkey, which is ever less visibly linked to NATO, of which it has been a member since 1952, but ever more neo-Ottoman and anti-American, considering that initially the United States have probably supported the coup and still host Fethullah Gulen, the Sunni Imam accused by President Erdogan of having organized the military insurgency. 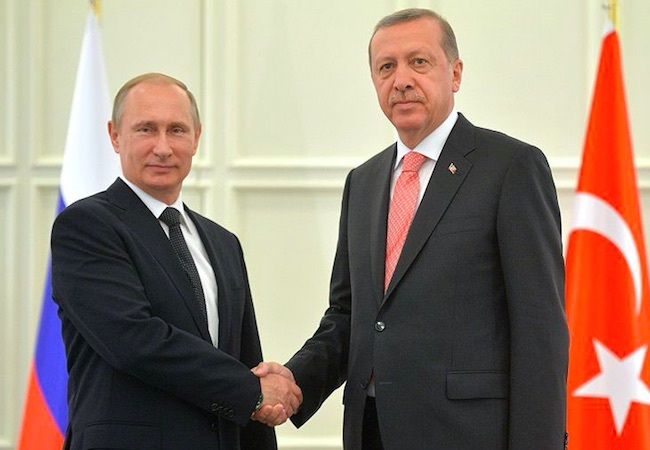 Nevertheless, nothing is yet certain in the rapprochement between Turkey and the Russian Federation. Certainly the Russian statements are possibilistic and basically deprived of long-term strategic guidelines and indications, but the results reached by Russia are already greatly significant: the weakening of the Southern and Eastern Flank of the Atlantic Alliance and the probable redesign and splitting up of Syria in agreement with Turkey. In President Erdogan’s mind, this is the right time to define his traditional Panturanic plan, which does not coincide with the Russian plan, but which has certainly nothing to do with the Atlantic Alliance’s prospects in Central Asia. Shortly before becoming Turkish Minister of Foreign Affairs in 2009, Ahmet Davutoglu had explicitly stated: “We are the new Ottomans. We will reconquer what we lost in 1911 and in 1923 and we will find again our brothers between 2011 and 2023”. Aleppo and Mosul, the Uygurs of Xingkiang to be “moved” to Syria, the Asian Turkmens and part of Iraq are all the pieces of the dominoes that President Erdogan’s AKP wants to build to become a great Turkish, Sunni and neo-Ottoman empire between Anatolia and Central Asia. Aleppo, Latakia and Idlib will be the 82nd province of Turkey, but this is obviously not convergent with the interest of Russia which, however, accepts the de facto breaking off between Turkey, the United States and NATO, while President Erdogan urges the Americans to choose between him and Fethullah Gulen. Paradoxically, however, President Erdogan’s neo-Ottoman approach has still much to do with the arch-enemy Fethullah Gulen. They both want to restore the traditional links between the Turkish populations, the use of the Turkish language, the Sunni Islam and the Ottoman Caliphate. Indeed, this would also explain the ambiguous attitude shown so far by Turkey vis-à-vis the pan-Sunni, though not Turkish, Caliphate of Daesh/Isis. For many years Gulen and his cemaat (community) of about 3 million members have been an apparently secular missionary movement which, however, wants to re-establish Islam throughout the pan-Turkish region having Sufi roots, as has often happened in Turkish nationalism. It also wants to ultimately superpose the plan of a new Sunni Caliphate on the plan for an expansion of the Turkish national power. On the contrary, President Erdogan comes from the National Outlook Movement, which is part of the Turkish Muslim Brotherhood, from which he departed after the military coup of 1997 in order to found the AKP with Gulen’s militants. In essence, President Erdogan wants to recreate a great Panturanic umma from China (the Turkish leader defined China’s behaviour in Xingkiang as a “sort of genocide”) up to Eastern Europe. Nevertheless President Erdogan mainly wants to “Turkify” the Muslim Brotherhood, which is still one of his tools, and not the quietist mystic Islam of Gulen’s movement, which also fanned the flames of the Ghezi Park rebellion and supported the allegations of corruption regarding the AKP regime. Turkey spent much to support the folly of the “Arab Springs” and President Erdogan spent very much to keep the Brotherhood in power both in Egypt and the Maghreb region. Everything becomes clear if we think about the way in which President Erdogan is operating in Syria: using those that the silly West calls “moderates” in public, while de facto supporting the jihadists, who are the current extreme fruit of the Muslim Brotherhood. This is President Putin’s bet: if Russia proposes an agreement on Syria, will President Erdogan temporarily stop implementing his neo-Ottoman project, thus putting aside his Wahhabi soldiers of the jihad? Hence if Turkey has a new system available to be connected with its Panturanic world, surrounded by Russia and China, will it cease to invoke the imperial myth, put in place by the bloody ranks of the jihad? No one can yet say so. Russia (and China), however, have the power to manage and greatly influence this new great game, while certainly the United States, NATO and the now useless European Union have not this power. It is worth noting that another player of the new link between Turkey and Russia is Iran. If, in exchange for peace with Russia, Turkey leaves the Sunni jihadist factions to their fate, Iran will tacitly support the Turkish ambitions in Iraq and Syria, through the Russian Federation’s protection. Peace with Russia and the agreement with Iran mean Turkey’s future participation in the recent “triple alliance” reached in Baku on August 8 last between Iran, Russia and Azerbaijan for the new economic corridor between India and Russia. And this is promised to Turkey in addition to the opening of the Turkish Stream gas pipeline, having a capacity of 30 million cubic meters, and the building of the nuclear power station in Akkuyu, Turkey, with Russian technology. Russia must absolutely have an energy line avoiding transiting through Ukraine. Turkey cannot survive without Russian gas, which accounts for 50% of its consumption. Furthermore the issue of migrants, with whom President Erdogan blackmails the naïve EU, is now in the hands of Russia, which can provide alternative areas and ways. President Erdogan also needs a new area of economic, geopolitical (and identity) expansion in Central Asia, provided that it does not officially annex the Turkmen communities that are numerous, but very divided in that region. In addition, President Putin can cool down and ease the tensions between Armenia and Azerbaijan over Nagorno-Karabakh, an Azerbaijani area with an Armenian majority. Certainly Armenians do not talk with Turkey. Armenia has also called for Russia’s protection to recognize its independence internationally, but Turkey has not yet many relations with the pro-Turkish Azerbaijan. Russia does not want to unleash the struggle between the Azeri-Turkish and Armenian peoples, which would probably trigger off a new destabilizing jihad in the Caucasus, while Turkey equally needs to quell tensions but has no relations with Armenia. Once again, in this case, both the United States and the EU play the second fiddle. As is well-known, in Syria Russia supports Bashar al-Assad’s Alawites, but Russia will not be in a position to afford the material and political costs of this commitment much longer. The Russian commitment in Syria costs at least 3-4 million dollars a day, which we have to multiply by all the days from September 30, 2015 – when the Russian air raids started – to date. Russia, which has a military budget of 50 billion dollars a year, can certainly afford it, but not with the prospect of low oil prices and the danger of a new hotbed of tensions in addition to the Syrian one. Furthermore if Russia does not reduce military spending by 5% – as President Putin has decided to do for 2016 – the prospects for Russian economic growth become grimmer. Moreover, since the beginning of the Inherent Resolve operation in August 2015, the United States have spent in Syria 11.5 millions per day. Obviously Russia cannot afford this cost for a long period of time, considering that the real strategic gain is only the protection of Latakia and the other Russian bases in the Mediterranean. Furthermore Turkey, which is de facto allied with Daesh/Isis and the other groups of the Syrian jihad, does not succeed in annexing Aleppo and the other Turkmen areas in the South, which is the real target of the Syrian war for Turkey. On top of it, President Erdogan can do nothing against the Kurds, who are supported by the United States. And the Turkish leader can swallow the bitter pill of a Kurdish quasi-State only if there is the annexation of the Syrian Turkmen territories and the creation of a strategic buffer between Turkey and the new Kurdistan, which President Putin might possibly guarantee to him. In the meeting held on August 9 with the Turkish leader, President Putting hinted at the fact that he wanted Assad to quickly take Aleppo by storm so as to unilaterally declare a cease-fire and call a conference to define the new borders and the new areas of influence in Syria. Today no one wages and fights the war in Syria thinking about a united country, not even Bashar al-Assad’s Alawites. The old plan of the Franciscan tertiary and Shiite mystic Louis Massignon, after the Sykes-Picot Agreement of 1916, is really over. That plan envisaged to hold Syria together by ceding it to the small coastal Alawite sect so as to avoid the Sunni dominance which, sooner or later, was bound to incorporate the “French” Syria into the British system (Iraq) or into Saudi Arabia’s Wahhabi system. It is also worth recalling that Turkey wants the Turkmen area around Idlib, Latakia and Aleppo so that it can act as a counterbalance to the Kurdish area. On the other hand, also in view of its internal peace, Turkey must also recover the level of trade with Russia which, after the sanctions imposed as a result of the shooting down of the Sukhoi24M aircraft in November 2015, fell to 6 million US dollars between January and May 2016, while the flow of Russian tourists in Turkey has plunged by as much as 93%. Therefore the agreement between Russia and Turkey is designed to a division of the Middle East and Central Asia. Turkey will have the opportunity of managing the new relations with the various Turkmen and Ottoman communities, while Russia (and Iran) will have the possibility of creating a large Asian economic community, which is designed to replace the symbiotic relationship between Europe and the United States. Furthermore, in Syria, the United States and Europe will be completely wiped out by this new agreement, which envisages that the design of this new “Eurasian entente” be started right from the Syrian territory. In the meeting held with President Putin in St. Petersburg, following up an idea already proposed in 2013, President Erdogan reiterated that Turkey could be ready to drop its request to join the EU if he were given the opportunity to adhere to the Eurasian institutions and the Shanghai Cooperation Organization, in particular. Nothing, however, prevents Turkey from also walking out of NATO in the future, if the appeal of the Eurasian system were to become irresistible. We must not even forget, however, that currently 44% of Turkish exports is still to the EU – a ridiculous strategic dwarf – and that, also as a result of sanctions, a mere 4% is to Russia. Moreover, it is not even likely for Turkey to have access to the most advanced technologies through Russia, apart from the military ones, or that opening to Russia may be the only means for Turkey to access world markets. Nevertheless we cannot rule out that the establishment of a real, solid Eurasian unity may definitely attract Turkey to the Russian and Chinese project of the economic and strategic autonomy of a new and united Central Asia. And in this case Turkey would be very useful, because it would provide the necessary connection with the Mediterranean. As already noted, Russia mainly wants to destabilize NATO eastwards and certainly the rift between Turkey and the Atlantic Alliance is certainly an opportunity not to be missed. Furthermore Turkey does no longer trust the United States which host and help Fethullah Gulen. It wants to create its specific, neo-Ottoman and nationalistic political Islam, thus closing the door both to the EU, which has not yet realized it, and to NATO itself, which is now a useless alliance for the Turkish Panturanic and Eurasian project. NATO, however, is still necessary to maintain the geoeconomic relationship with the EU and the United States, which is valid as long as Turkey does not replace it with the one with Russia, China and Central Asia. Hence if Donald Trump wins the US presidential elections, the Russian project of Turkish integration into its geopolitical system will continue, while if the winner is Hillary Clinton, who is obsessed by the future US contrast with Russia, NATO will resume its action in the Middle East. This is the reason why it is extremely useful for President Putin to allure Turkey. At geoeconomic level, Russia can no longer afford a system of low oil prices – and, in the future, levelling off at around 40 US dollars per barrel – unless a major increase is recorded at the end of 2016, as some analysts predict. This is the reason why it wants to sell a lot of gas to Europe through Turkey and it is opposed to the military and jihadist designs of Saudi Arabia and its allies, including the United States. Hence currently the jihad is a substitute for the oil economic war which can be no longer waged and fought. In fact, the energy world has changed: the United States are no longer the largest oil importer; the euro price of the oil barrel is higher than the one denominated in US dollars and the 40 US dollars per barrel are the tentative scenario for the Russian decision-makers. Hence, Russia shall come to terms with this tight budget in the Middle East and Syria. Moreover the cheap oil of the new Iranian exports – all directed to the East, would favour the Russian aims and designs in Central Asia also at geopolitical level. And it would also favour its potential for selling the Turkish Stream gas in Europe. Hence, if the Russian Federation opens to Turkey, it will be in a position to reach both the goal of the expansion of its oil market in the West and the goal of the maximum separation of Turkey from NATO. It is a “win-win” game for Russia, which could ultimately quell tensions in Syria, which also block Turkey’s plans. Therefore it is a “win-win” game also for Turkey. For Israel, which has recently renewed its relations with Turkey and can no longer fully trust Russia, which must support Iran and the Hezb’ollah in Syria and the Lebanon, the new Putin’s and Erdogan’s Syrian plan can be useful to mitigate tensions on the Golan Heights and use the Turkish Panturanism for the anti-jihadist stabilization of the Middle East. But even this is a project to be checked and verified in the future. Professor Giancarlo Elia Valori is an eminent Italian economist and businessman. He holds prestigious academic distinctions and national orders. Mr Valori has lectured on international affairs and economics at the world’s leading universities such as Peking University, the Hebrew University of Jerusalem and the Yeshiva University in New York. He currently chairs “La Centrale Finanziaria Generale Spa”, he is also the honorary president of Huawei Italy, economic adviser to the Chinese giant HNA Group and Khashoggi Holding’s advisor. In 1992 he was appointed Officier de la Légion d’Honneur de la République Francaise, with this motivation: “A man who can see across borders to understand the world” and in 2002 he received the title of “Honorable” of the Académie des Sciences de l’Institut de France.